The Isle of Man’s first publicly accessible ‘Changing Place’ is now open at the Manx Museum, thanks to a grant from the Manx Lottery Trust with match funding from the Manx Museum and National Trust charity. The Changing Place will provide a safe and fully equipped bathroom for people with multiple disabilities and complex needs who have difficulty using standard accessible toilets, including people with illnesses which impact mobility such as motor neurone disease and multiple sclerosis. 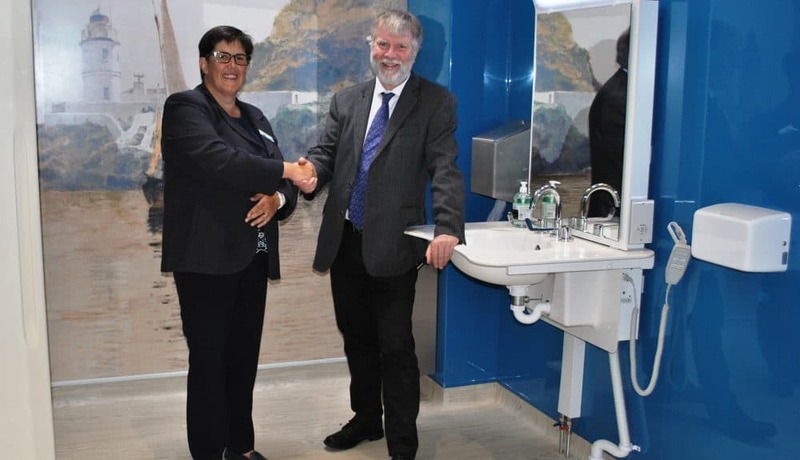 The facility includes a height adjustable changing bench and overhead powered tracked hoist, an adjustable washbasin and centrally placed toilet with room either side for carers. A ‘Quiet Room’ has also been installed for visitors who may experience heightened sensory anxiety and for use as a space for those who may need or wish to use the room for quiet contemplation. The facility has been designed with the input of the Changing Places Consortium as well as disabled people and their carers, and will provide publicly accessible facilities to enable people with complex needs to stay out longer in the Isle of Man’s Capital, visit the Manx Museum and enjoy the surrounding area. A grant of £25,147 was awarded to the Manx Museum and National Trust, with the remaining 53% of the total cost of £54,024 covered by its charitable funds. There are only a few equivalent facilities at schools and colleges around the rest of the Island, but these aren’t freely accessible to the general public.